Home » china » climbed » russians » shanghai tower » Two Russian men illegally climbed up the Shanghai tower in China. Two Russian men illegally climbed up the Shanghai tower in China. Do you remember our post about the death defying stunt of James Kingston at the Ukrainian Bridge? Well, here’s another group of height-conquering adventurers with their stomach-churning act. And this time, it’s even crazier and more heart-dropping. Shanghai tower is a skyscraper under construction and is considered to be the second tallest building in the world. The building stands approximately 632 meters (2,073 ft) high. And while the building is not yet open to the public, two Russian thrillseekers traveled to China to test its height. The video, released on Wednesday February 12, 2014, has already been viewed over 8 million times. 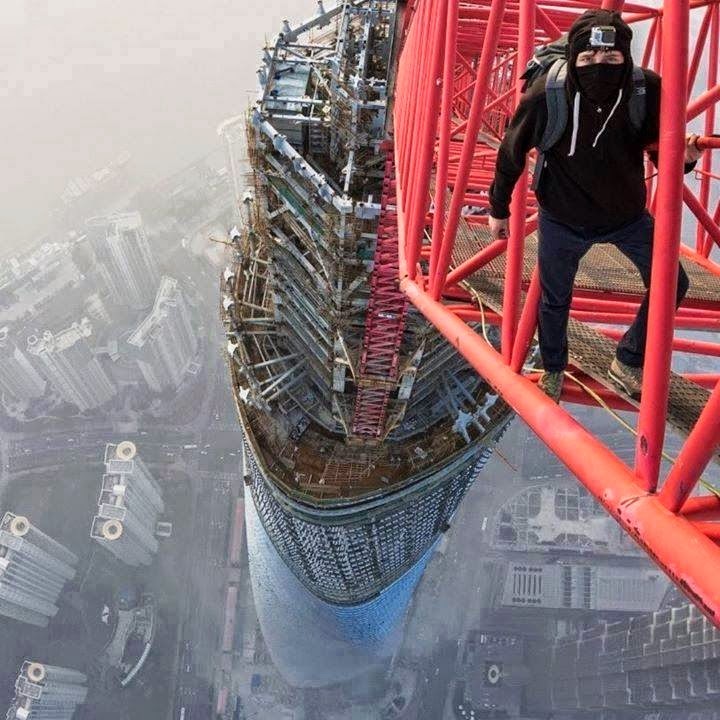 It shows the two Russian daredevils (Vadim Makhorov and Vitaliy Raskalov), climbing the still under-construction Shanghai Tower (second tallest building in the world). The Shanghai Tower is still under construction but two daring and quite frankly, insane guys decided, to illegally climb it. Of course they did not have any kind of safety equipment or ropes (Totally Russian style,right?). Raskalov says the pair started climbing on January 31st, which not by accident was the first day of China’s Lunar New Year, a major holiday in China. To get to the 120th floor by foot, it took them whole two hours. When they finally reached the top they were forced to wait for another 18 hours, for better weather so they could make astonishing pictures that are not recommended for people scared of heights. As the rooftop was not enough for these adrenaline junkies they decided to climb the construction crane, meaning a truly dizzying height of 650m was reached. The pair of daredevils are Vadim Makhorov and Vitaly Raskalov and they are not new to this kind of extreme freeclimbing. The two masked men sneaked into a poorly lit building site and climbed up unvarnished concrete stairs. Under the cover of darkness, they made their way up to the roof of the skyscraper. And when the morning came, they continued their death-defying journey. Peering over the side, the upper floors of the distinctive 492m Shanghai World Financial Center and the neighboring 421m Jin Mao Tower can be seen peeking through low lying clouds. Undaunted, the pair then moved out onto an 18 meter crane and went on climbing skywards. Upon reaching the very top of the crane, one examined his hands which were dirty from the long climb. Then the pair gave each other a high-five, signifying that their mission has been accomplished.